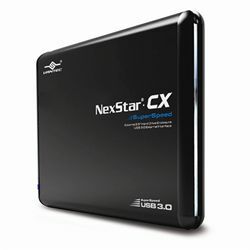 Create a small home for your largest files with Vantec's NexStar CX USB 3.0 enclosure for a 2.5in laptop SATA hard drive. Suitable for drives up to 1 terabyte in capacity and up to 12.5mm in height, it utilizes the accelerated transfer speed of USB 3.0 to rapidly exchange files with your computer. The included double-headed USB ensures your drive runs consistently without needing an AC adapter. Includes USB cable and 2 screws. Requires 2.5" SATA hard drive, not included. Max. transfer speeds require USB 3.0-compatible computer and SATA 3.0Gbps drive. Pros: Was extremely simple to install the SATA HDD from an old computer and fire up. I was able to access files quickly and without any issues. Other Thoughts: Great way to re-use the HDD from an old computer to either reclaim files or create a handy external backup drive.